Flat rate bee removal and control in Mesa. Guaranteed service for one flat fee. Honeycomb removal and repair service in Mesa. From start to finish we will take care of it all. 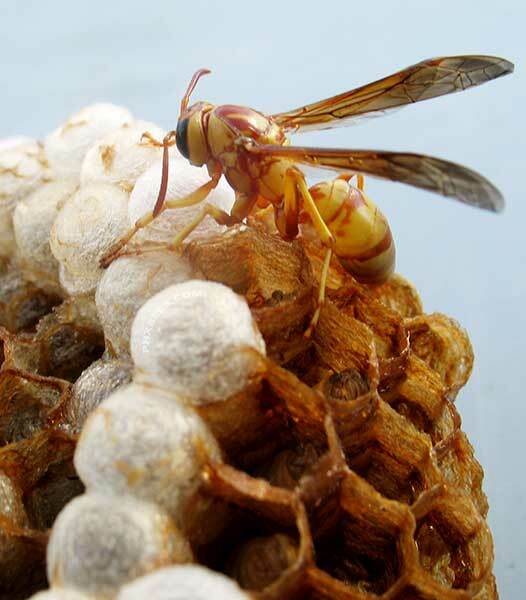 We offer extermination services for all species of wasps, hornets, and other stinging insects in Mesa. Have bees in a wall or eaves of your home in Mesa? Or maybe have a bee swarm in a tree? Phoenix Bee Removal offers a flat rate bee removal and control service for Mesa residents. Our hassle-free bee removal service will have your bee problem taking care of quickly and safely. Bee Removal in Mesa has become commonplace throughout the Spring and Summer Months. We get a large number of bee calls during Spring and Summer months in Mesa. One of the valley's largest cities actually one of Arizona's largest cities and with all the population growth in the past couple of decades, bee removal has become a very common issue in Mesa. Call us today about your bee problem for your free phone consultation. We off flat fee bee and honeycomb removal services for Mesa, and also surrounding cities. We have been treating and removing bees in Mesa Arizona since 2007. Providing an honest, affordable bee removal company with an extensive background in home building and construction. 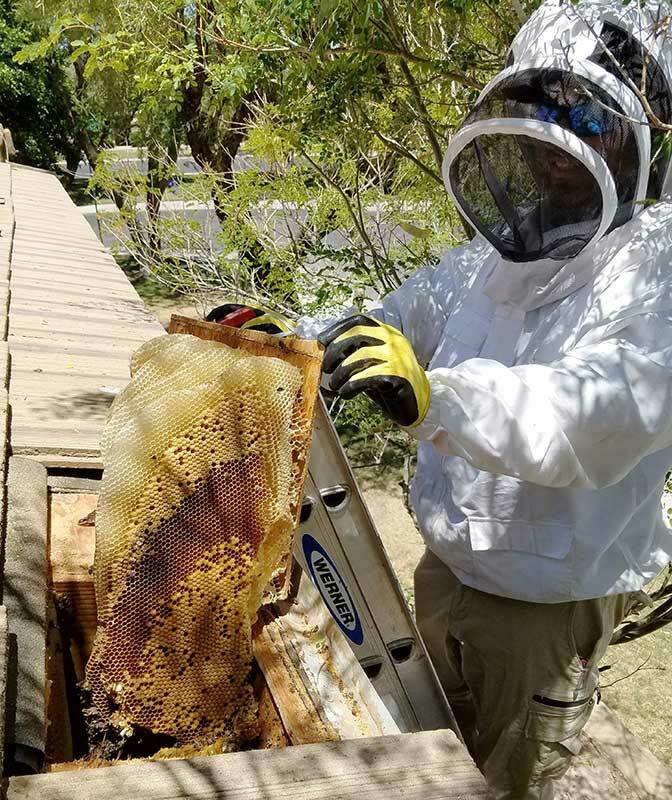 Knowing the way homes in Mesa are built is a huge advantage in safely and properly removing a beehive and repairing the area to eliminate the problem permanently. We have over a decade of experience in all phases of home building in Mesa. This experience goes hand in hand with bee removal and gives us a huge advantage over any of our competitors. We have removed hundreds of beehives over the years and have seen just about everything there is to see when it comes to removing bees. An Africanized Beehive can quickly get out of hand if the bees are not handled properly. Africanized bees or killer bees are abundant in Mesa and can become very dangerous in spring and summer months if not handled properly. The safety of you and your neighbors is a top priority for us at all times. Safely removing Africanized bees is a skill that takes years to get right and even then things can still unexpectedly happen. 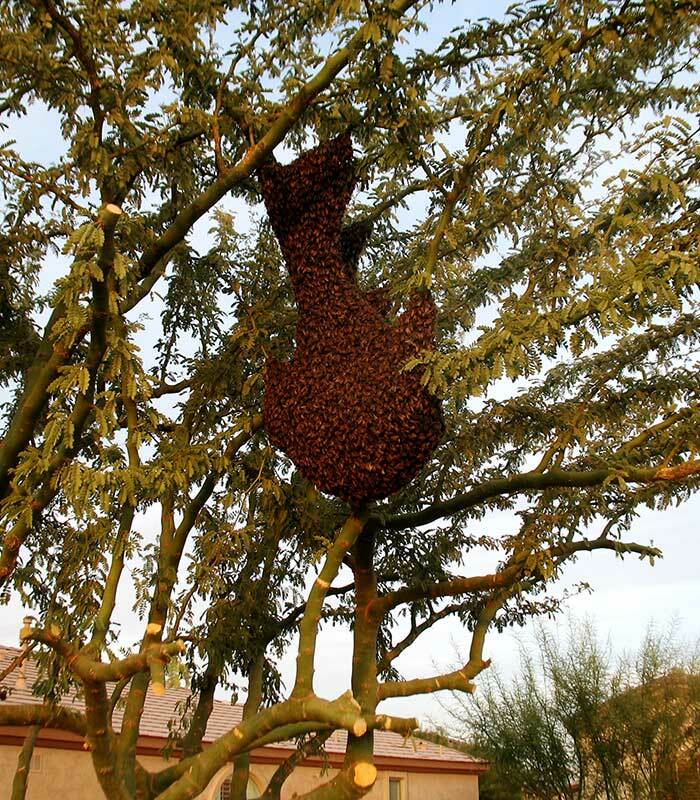 this is why it is important when choosing a company to safely remove Africanized Bees from your property in Mesa. Once established in your home (walls, roof, etc.) bees can produce honey at an astounding rate. Depending on the size of the beehive, the number of bees and the length of time they have been established, bees can produce up to a pound of honey a day. When this happens inside the walls or attic of your home and the bees are not there to stop it from melting all of the wax will melt and release the honey. This can cause thousands of dollars in honey damage and most insurance companies do not cover damage from bees or honey. All of the bees in a hive are females with the exception of a few drones (males) who lazily lounge around the hive until they are needed for reproduction. So once the bees start to reproduce and nurse babies all the female bees are, in a sense, mothers who will protect their children from anything they consider a threat. Bee attacks happen all to often in Mesa and other cities around Arizona and in most cases could have been easily avoided. Homeowners or tenants who try to treat bees themselves or try to get rid of a beehive with store bought cans of pesticides make up a majority of the people who get attacked by a defensive beehive. Never attempt to treat bees with store-bought pesticides this can and has in many cases lead to severe injury to the person attempting to treat the bees and innocent bystanders in the near vicinity of the defending beehive. Africanized bees can start attacking in an instant and without warning so you should always stay alert when landscaping around your home or hiking in an unfamiliar area. Hikers who wander off-trail also make up a good number of bee attack victims. These can also be avoided by staying alert and staying on marked trails that are heavily trafficked. Trails with more foot traffic are far less likely to have an established beehive on them. This honey has to be removed to prevent property damage, another bee colony from moving in, also an unprotected beehive will attract pests like ants, roaches, and rodents. Give us a call for all your bee control or removal issue and get all the information you need from an experienced bee removal professional and see what steps you may need to take to aid you with your bee problem. Have a bee swarm in a tree? Bees swarm in Spring and Summer months in Mesa AZ and can end up stopping and resting on a tree limb along the way. This is often mistaken for an active beehive and people usually overreact. Migrating bee swarms are normally harmless and are not defensive or dangerous. A bee swarm may hang around for up to 3 days but normally will leave within 24 hours after arriving. The most common trees to find bee swarms on in Mesa AZ are the Mesquite and Palo Verde trees. These trees do not provide a lot of cover from leaves and can easily be spotted. We recommend leaving the bee swarms alone and letting nature take its course. Most of the bee swarms in Mesa AZ will end up making a home in the desert and not bothering anyone. However, others may move into homes and businesses creating a hazard a will then need to be taken care of. If you have bees in a tree and are not sure if it is a swarm, please feel free to give a call and we will help you determine if you have a bee problem or not. Have Bees in or under a shed? This is a big problem in Mesa AZ. Under the floor of a shed is a perfect place for bees to escape the extreme Arizona Summer heat and also stay protected from predators. Most people have some sort of storage shed or unit on their property. These sheds can become the perfect home for honey bees to establish themselves and start a beehive. Quickly becoming a danger to anyone or anything that may make the bees defensive. Bees love to make beehives under these sheds and can multiply at an astounding rate once they've become established. Also, bees can go unnoticed for greater periods of time underneath a shed since they might not be used for long periods of time. 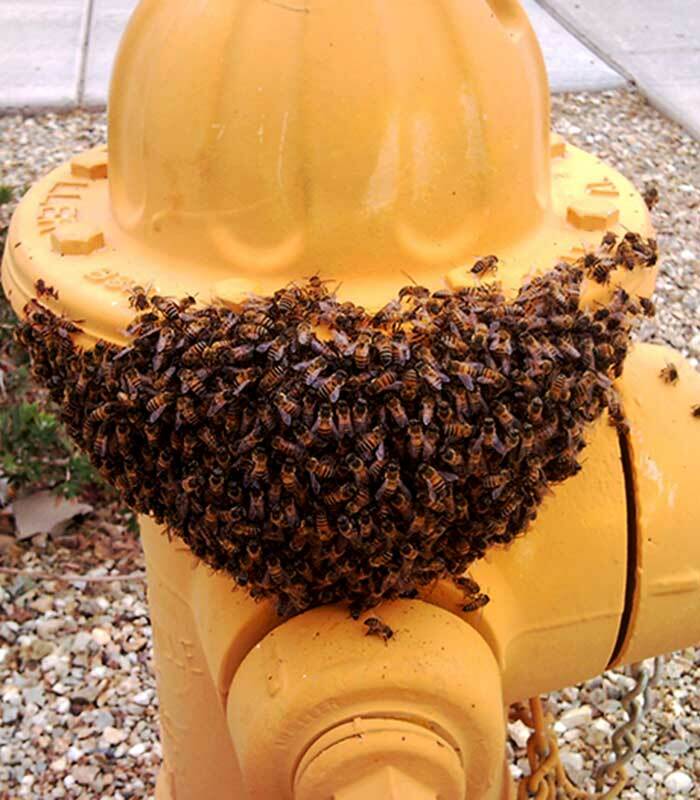 These situations can quickly become dangerous and have lead to numerous bee attacks in the Mesa area. There is no easy solution to getting bees out from under a shed and in most cases are Africanized bee colonies. In most cases, the bees will have to be treated and the floor cut up so the honeycomb can be removed. We always recommend removing the honeycomb to prevent rotting and becoming a target for ants, mice, rats, roaches, and other pests. Also, it will attract other bees to the shed possibly making a home somewhere else. We offer hassle-free bee removal from under sheds as well as other storage units in Mesa AZ. Phoenix Bee Removal will take care of everything from start to finish to ensure the bees under your shed get taking care of adequately safely. We will repair any cuts made in the flooring and seal any entry points to keep any future beehives from becoming established. Have bees in a valve box or water meter box? Bees have been making homes inside of these since day one. They make a perfect bee box for the bees to set up a beehive and produce honey. They keep the bees protected from the intense Mesa Arizona Summer heat. These can go unnoticed for long periods of time and become a danger to anyone who gets to close to the hive. Attempting to seal the bees in will only lead to more problems and can end up with someone getting unintentionally attacked by bees. Phoenix Bee Removal will take care of bees in a valve box in a safe and efficient manner. Give us a call today to have your valve box bee problem solved. Have bees in the eave of your home or business? Bees often choose the attic space of your home or business to establish a beehive. They can enter through the cracks in the blocks or holes in the screens of the vent blocks between your roof trusses. Once inside the attic they waste no time getting set up and producing honeycomb. Once honeycomb is established it will need to be removed to prevent property damage. Also, the pheromones left by the bees will attract other bee swarms in the future and they will build a new beehive on the outside of the eave. This will become an ongoing problem until the honeycomb is removed and it is cleaned of all pheromones. We offer honeycomb removal from roofs and eaves for Mesa AZ and surrounding areas with repairs. All of our honeycomb removal services come with a 3-year guarantee. Have bees got inside of the walls of your home or business? Bees are small and can often fit into small cracks and crevices that we can't see. Stucco homes are a good example of this. The flashing on the bottom of stucco walls is an easy entry point for bees and other insects to enter the walls of a home. Bees will find a wall either devoid of insulation or has had the insulation moved or doesn't cover enough of the wall void leaving room for the bees to create a hive. Garage walls are not commonly insulated in Mesa AZ and are a common spot for beehives. Phoenix Bee removal can remove beehives and honeycomb from garage walls and also repair any damage done doing so. Block walls and retaining walls are notorious for making great insect habitat and that goes double for bees. The bees will create a beehive inside of the hollow walls and use any cracks in the mortar as an entry/exit point. These hives usually go unnoticed for weeks or months as well and the bees can become defensive if anyone gets to close. Trying to seal the wall normally just makes the problem worse and can cause someone to unintentionally get attacked by the bees.